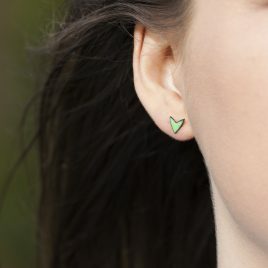 Grass Green enamel ear studs hand sawn from sheet copper in a green shoot, unusual shape, inspired by a little seedling plant. 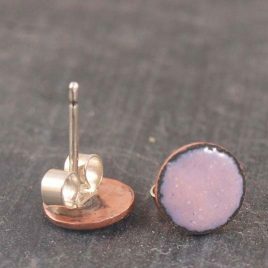 The copper vitreous enamel ear studs have a sterling silver ear post soldered onto the back. The glass enamel powder is kiln fired and fused onto the copper metal to create a striking glass like coloured surface appearance. All of my jewellery is designed and made by myself so please feel free to request different colours or sizes. Matching items can also be made to commission. 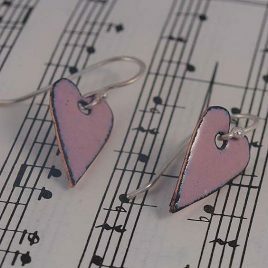 Gorgeous pale rose pink enamel earrings on a sterling silver earwire. 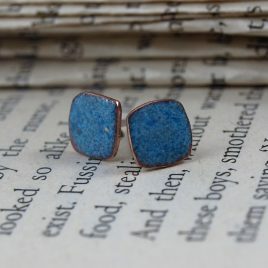 These would look fabulous with your little black dress for an elegant evening look or would be fun to were with denim through the day. 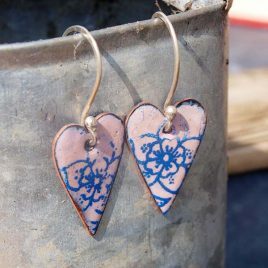 The hearts have been cut out of copper in an elongated rustic heart shape before the enamel is applied and kiln fired. 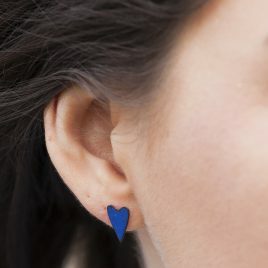 I have finished the earrings with a handmade sterling silver ear wire. The size of the heart is about 2cm. All of my jewellery is delivered to you gift ready in a cotton linen hand stamped gift pouch with gift card. 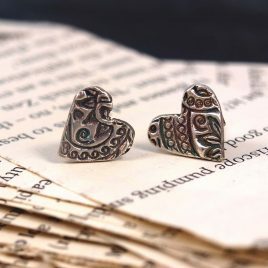 Little fine silver heart stud earrings. 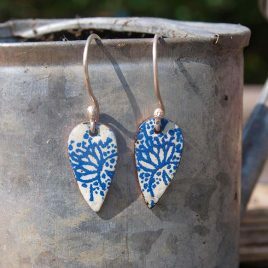 These beautiful little earrings have a decorative floral pattern pattern which has been highlighted by oxidising the surface to create a more vintage appeal. 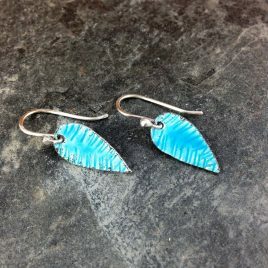 The earrings have a sterling silver post and scroll, and are around 12mm in size. 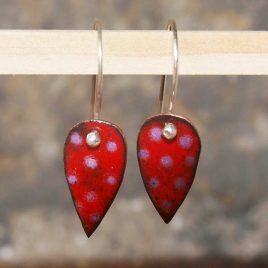 Contemporary Red Circles Copper Enamel Earrings. 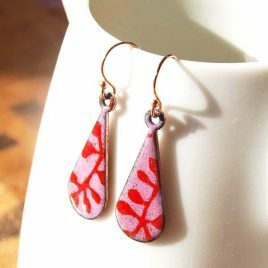 Made by hand using a copper base onto which layers of enamel powder are kiln fired and a pattern is then scratched through. Traditionally this is known as sgraffito. 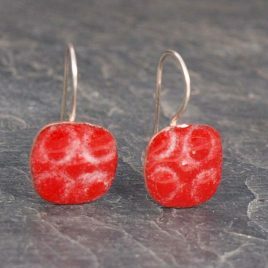 Great artisan earrings for everyday wear or for a well thought gift for someone special. All My Cherry Pie Jewellery is delivered in a handstamped cotton gift pouch.